Kinect Sports: Season Two is one of the few first party Kinect titles to be released this year. 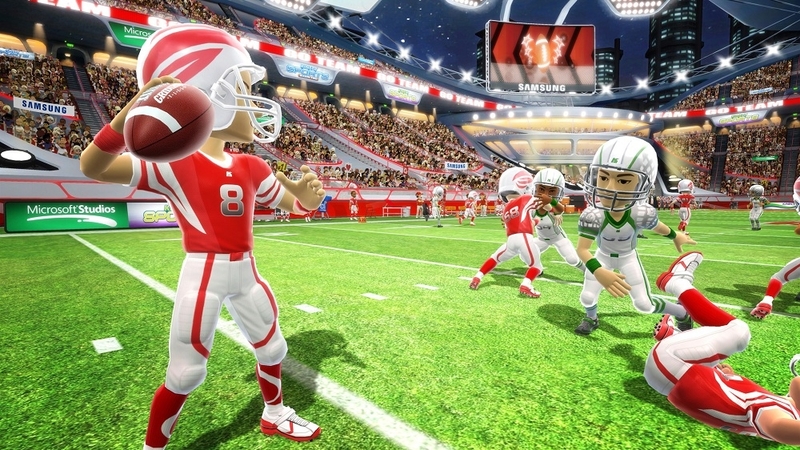 Nearly a year after the original Kinect Sports game released, Season Two features five new sports as well as voice controls. The new sports include golf, tennis, baseball, football, skiing, and darts. Some work well, while others are not so great. Tennis functions like you would expect. Your opponent hits the ball towards you, and you hit it back. You can put power into your shots by stepping forward and hitting the ball. You can also add spin to the ball by hitting the ball from top. Hitting slams on your opponent is extremely satisfying. For baseball, you go up and bat until you strike out. You will either get a single, double, triple, or homerun depending on how far you hit the ball. When playing defense, you get to pitch the ball. The game will tell you the batter’s weakness. Sometimes you will want to throw a right hand fastball, while other times a slow left hand curveball may be more appropriate. Other than batting and pitching, you will be able to catch balls in the outfield and (sometimes) run to bases. This sport just seemed overall pretty well put together and was fun to play. Next up is golf. The main thing I didn’t like about golf is due to the limitations of Kinect. The Kinect didn’t accurately track how fast I was swinging my club. When I would try to hit the ball with 50% power, it would end up going 100%. Putting was even worse. Kinect simply couldn’t tell how far back and how far forward I was moving my hands while putting. These are two big complaints, as the main part of golf is hitting the ball. Everything else worked fine for me. You can change clubs with your voice, which was pretty cool. Darts is pretty bad. When throwing a dart, you align your hand with where you want it to go on the dartboard. You pull back, and that area will lock in. This was really frustrating. I’d have my target area but as I pulled back, it would go all over the place. After pulling back, you throw the dart. Kinect will track how accurate your throw was, and your dart will be thrown on the board accordingly. Not only did darts not work well, it was also pretty boring. Finally, skiing. It is just okay. You lean left and right to move, and go down to increase speed. There’s really not much more to discuss here, as there isn’t a whole lot of depth to skiing in Kinect Sports: Season Two. For the most part, skiing seemed to control well. There really isn’t much to say here. If you have played the original, you know what to expect in the graphics department. The game is cartoony and colorful; you control your avatar as you play the sports. Your avatar will wear pre set uniforms while playing the sports, rather than the clothing that is on your avatar. Each sport has different difficulties. You unlock more as you beat an opponent at the lower difficulty. Other than just playing the sports on different difficulties, there is one mini-game for each sport (except for football). This is pretty disappointing, as the original Kinect Sports had multiple mini-games for each sport. One of the best things about the game is the menu navigation. The hand tracking feels spot on, and every menu can be controlled by your voice. Usually, you will be required to say “Xbox” followed by the options that are listed on the screen. When playing some of the sports, you just have to say the command listed. Like many other voice-controlled applications, sometimes Kinect doesn’t hear you properly. When it does hear you however, it’s a really neat feature in Kinect Sports: Season Two. Kinect Sports: Season Two is a mixed bag. A few of the sports were fun, while others were disappointing. Menu navigation has been greatly improved from the original and voice controls were a welcome feature, even if they didn’t work perfectly. The game gets boring really fast, and there’s nothing that will keep you coming back to play. There is also a free DLC available, with hopefully more to come in the future. Although there are some minor control issues, it can’t stop me from recommending this game to anyone looking for a great Kinect game. Avoid this game at all costs, young Padawan...and may the force be with you, always. Technically speaking Kinect Sports Rivals is a far better Kinect experience than the previous two entries. But even with that, the game still feels like an under realized experience. None of the six events have much in way of replay value and outside of a few party scenarios the game doesn’t have the legs it needs to warrant a sixty dollar purchase. For me Kinect Sports Rivals is a passable Kinect game that does little to nothing to push Kinect game experiences forward. If anything it might do the exact opposite.